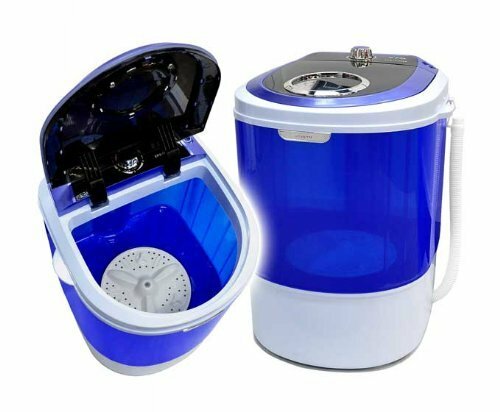 Check out Panda’s Mini Washing Machine, just what you need for loads of delicates, like underwear, socks, and T-shirts, or small loads of everyday essentials like towels, jeans or sheets. No more dragging your clothes to and from the laundromat. This highly portable machine goes anywhere, is easy to operate, and best of all? no quarters needed. Use it just for your delicates, or keep it in the baby’s room for a quick wash. So if you’re small on space, but big on having clean clothes, the Panda Mini Washing Machine is likely to be a perfect fit. Weighing in at 11 pounds with dimensions of 14 x 14.6 x 19.3 inches, and a capacity of around 5.5 pounds, the Panda Mini can go anywhere, and will be much easier to lug around than your loads of dirty clothes. The Panda Mini Washing Machine makes the perfect gift for college students, apartment dwellers or travelers, and for under 90 bucks, how could you go wrong? Available now at amazon.com, and if you’d like to go all out, pick up the Panda Mini Tumble dryer for around 229 bucks.